PokeBeach12. That’s the number of Gyarados that have been printed in the Pokémon TCG. Despite receiving the ex, SP, Star and Delta Species treatment, Gyarados never saw play. However, during Worlds 2009 all of this changed. A player from France not only used Gyarados at Worlds but also made it into the Top 16 (I think his result was 5th or 8th place, but I cannot recall for certain). Enough with the introductions, let’s check out Gyarados SF! Gyarados is a Stage 1 that evolves from Magikarp, so don’t expect to get any help from its lower evolutions. Being Water isn’t too bad as not much resists you, but you won’t be hitting anything other than Donphan and Charizard for Weakness either. A +30 Lightning Weakness stings because of Luxray GL and Magnezone, but the -20 Fighting Resistance certainly helps against Machamp. The three Retreat Cost is really disappointing, but is expected. Gyarados has no three attacks, two of which do nothing to up Gyarados’s playability. “Dragon Beat”, for the gigantic WWCCC does 100 damage and provides a coin flip. If heads, you can discard an Energy attached to each of your opponent’s Pokémon. Ignoring the fact that it requires an obscene amount of Energy, 100 damage and mass-Energy removal can actually be useful. 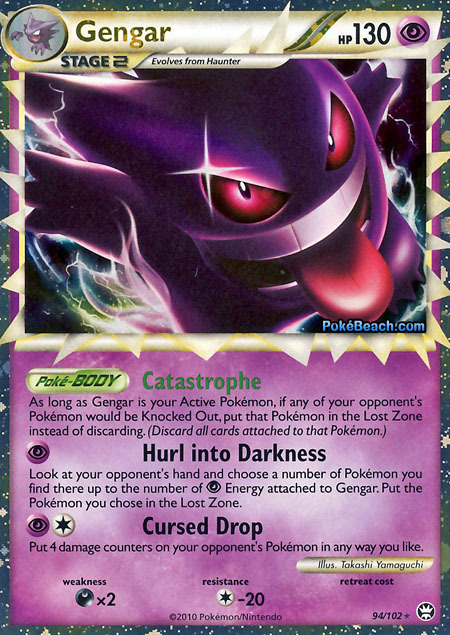 Not only should it KO the opposing Pokémon, but it could potentially make a Revenge KO more difficult for your opponent. Unfortunately, the cost is just to high to make the attack useful. However, as a fun deck, you could combo Gyarados with Feraligatr Prime for accelerated Water Energy attachment. “Wreak Havoc”, for WC, does 40 damage along with one of those “flip until you get tails” effects. In this case, for each heads you receive, you get to discard the top card of your opponent’s deck. The funny thing about these types of attacks it that, if you were to get 15+ heads in a row, they would be obscenely good for low damage. However, the luck factor just plays to large of a role in this attack. “Tail Revenge” is where Gyarados really shines, it does 30 damage times the number of Magikarp you have in your Discard Pile for free(!) That’s right, you can do up to 90 damage for no Energy Requirements once so ever. Obviously, this is the attack that has kept Gyarados from being binder fodder and allowed it to see some serious competitive play. PokeBeachThe object of most Gyarados decks is to use Regice, Junk Arm or in some cases Volkner’s Philosophy to get three Magikarp into your Discard Pile as quickly as possible. Meanwhile, you get a Gyarados (preferable with an Expert Belt attached) swinging for 90 (110) damage each turn (for no Energy!). The use of Super Scoop Ups, Seekers + Warp Energies, Pokémon Rescue, Rescue Energy and Combee ensures that you always have a Gyarados ready to attack. The biggest threat to Gyarados is, in my opinion, Gengar Prime. When Lost World is released in Call of Legends, LostGar is sure to be a very powerful force in the format. Unfortunately, with Gengar’s ability to send Magikarp’s to the Lost Zone (either by taking them from your hand or by KOing a Gyarados in play), Gyarados will have a very difficult time against it. My Recommendation: Right now, it’s a great play. If LostGar becomes popular, you’ll almost be forced to run Dialga G Lv.X to make it more difficult for your opponent to “Lost Zone” your Magikarps (the only way they’ll be able to do so is by taking them from your hand via “Hurl into Darkness”. Base set gyarados was played in raindance sometimes. This gyarados will probably be the last playable one we see.